Years ago I saw plans in a woodworking magazine for a wooden version of the Delta 1170/1172 tenon jig. I have long since lost the magazine and don’t remember the magazine that it was in. If anyone remembers these plans, either which magazine it was or has a copy of the plans, please let me know. I am not interested in other tenoning jig plans, so please limit response to this particular jig. Thanks if anyone can help. 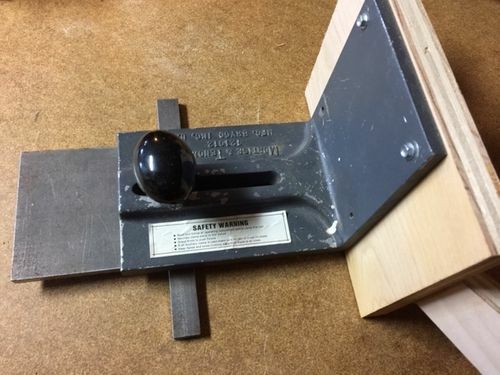 Pinterest has a bunch of them This link loaded to one Rockler is selling a plan for 8 bux, many on there probably show enough to make one for free though. You can make the classic that runs in the miter slot flavor, or most are going to a fence straddling type. With those you can make tenons set up one way, and adding or subtracting make a panel sled, for cutting bevels for doors, and then change a few things and make a cradle that works with it to do splines. Biggest thing with the fence straddlers is make darn sure it sits square to the fence, even a degree out will mess up the works come time to assemble. If you really want the Delta, look on craigs List, and check auctions. Maybe it’s just me, but I see the old metal ones often for less than 10 bux. Non Woodworkers don’t even like them for a door stop. Pretty sure i have seen a couple in Shop Notes and somebody here ws giving away years of them recently. Or you could maybe google Shop Notes Tenon jig, maybe it will find which issue. I may still have it but searching the physical copies is a pain. Where have you looked so far. No use all of us looking the same place you have. I have googled several times and searched the Pop Woodworking and Shop Notes back issue database. Again, I am looking for a very specific tenoning jig plan, not for just any tenoning jig. I am also not looking for the metal version which does come up on eBay on occasion for 250 plus. Yes there are plenty of tenoning jigs to be found cheaper, and plenty of plans for tenoning jigs. I don’t have need of a tenoning jig, but I want to build this specific one because it was as much a work of art as it was a jig. At the time I had the original magazine, I didn’t have the skill or tools to build it. Over several moves, I seem to have lost the magazine. You have my interest peaked as to what jig you are remembering. I have seen things like that and have kept a memory of it like you. Then it seems very difficult later on to find the article or book or whatever. So I understand. About all I can offer you is the suggestion to try a build from what you do remember. There are quite a few plans available. Why not use the info to come up with your version. The tenoning jig is basically a 90º fixture with a fence that either straddles the table saw fence or alternatively has it’s own mitre slot runner. And then some method of holding the stock vertical to a block also at 90º. Give it a go and let us see what you come up with. If you could find one of these, it would make a good start for building your jig on. I think I found this one in a thrift store for a couple $.